I was super excited to read another book by Cat Clarke. I've loved all of her previous books and I love how emotional everything she's written has been. I especially loved the idea of this book.... the idea of a large secret that comes between two people starting out in a new relationship. I don't fully understand why the official product summary is vague about this secret that threatens this relationship between Alex and Kate, especially as the secret is revealed (to the reader) fairly quickly. I wish that books such as this would be a little bit more open about the topics that it covers as I now feel like revealing the secret in this review will spoil something for others in their own reading experience. So I will have to keep the rest of this review slightly vague. I think the thing that I loved about this book is that it is a book that showcases the strength and beauty of love. I absolutely adored both main characters in this book, but especially Alex. Alex carries around this huge amount of guilt and for that I really came to care more for Alex than I ever expected despite the lies and deception that takes place. Alex is a person who believes that this relationship with Kate is an opportunity for happiness and love that could potentially be missed out for good if this secret is revealed. So things carry on with Kate far longer than they should and while Alex and Kate slowly fall in love with each other, their happiness is tinged with this awful foreboding for what will happen when all parties learn the truth. I felt really bad for both Alex and Kate. My heart absolutely broke for them both and while I hoped for a happy ending, it really didn't seem at all possible. A Kiss in the Dark is told in two parts, before and after, and we are able to see this relationship from both Alex and Kate's perspective which I think was really interesting, especially as in both parts each of these characters is dealing with some pressure and guilt for their own actions. I think it was definitely important to see things from both points of view in order to get a clear picture of everything that has happened though I did find it a little harder to connect with Kate's narration. The other thing that I really loved about this book is the support from Alex's mother and brother. I really love both of these characters and the ways in which Alex's mother and Jamie go out of their way to voice their love and acceptance of Alex both in subtle ways as well as in more explicit terms. 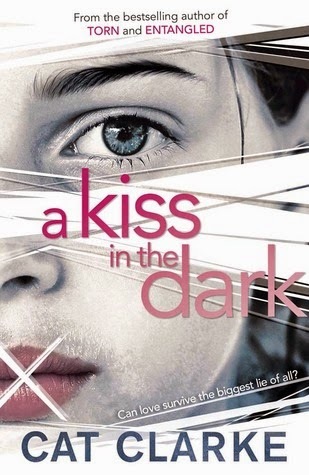 A Kiss in the Dark was a really interesting book to read. I loved the way in which perceptions of gender and sexuality are challenged and explored. I found it interesting to see both main characters dealing with an awkward situation and carrying it on longer than necessary even when it becomes apparent how hurtful the consequences are because of how difficult it becomes to tell the truth. But more than anything else, I thought Alex and Kate's love was a really beautiful thing to witness and I'm so glad that I took this journey with them. Well done, Cat Clarke, for writing such a beautiful, emotional, and heart-wrenching story! Highly recommended. I LOVE Cat Clarke's books - cannot wait to read this! It sounds fantastic (as all her books are) and I'm very much looking forward to finding out what this secret is as I've seen it mentioned in other reviews too. Lovely review! I really enjoyed Entangled and Undone (have not yet read Torn), but there's something about this book that puts me of. Partially the cover, because I do not like that cover at all. Terrible. I think the other reason is that Clarke writes a certain kind of book - the edgy, dark kind... and I am just not in the mood for that type of book right now. Perhaps I'll read it at some point in the future, but right now, it just doesn't appeal to me. I know what you mean about blurbs not talking about something that happens right at the very beginning! So annoying! It's the same with Golden Boy by Abigail Tarttelin. I revealed what happens, but I put up a spoiler warning, and explained that the big reveal happens to early on, it's not *really* a spoiler, in my opinion. Then people choose to read or not read. I don't really have strong feelings about the cover either way? I just started this this morning and I completely agree with you about the spoilery bit as I already know what that's what I'm going to want to talk about it my review but I feel like I can't! Loving it otherwise, though! Isn't it difficult, Sophie :( WHYYYYYYYYY not be upfront about what it is? Thanks, Jesse! It is a definite winner! I agree wholeheartedly with this entire review. I read this just last night and reviewed it. Loved it so much. Honestly, you did an amazing job of reviewing it without spoilers! I really love so much the character of alex, I love how "he" worry and care kate and the little details that "he" give to her. Is easy fall in love with alex (in my opinion). And Jaime! Their support was amazing he is a really one of my favorite characters on the books! A such great person. Thank for this realistic , deep and amazing review.